We’ve been very lucky, as of late, to be part of many different markets and fairs. It’s so great being part of these gatherings as we get to meet many fellow talented artisans and get our brand out . 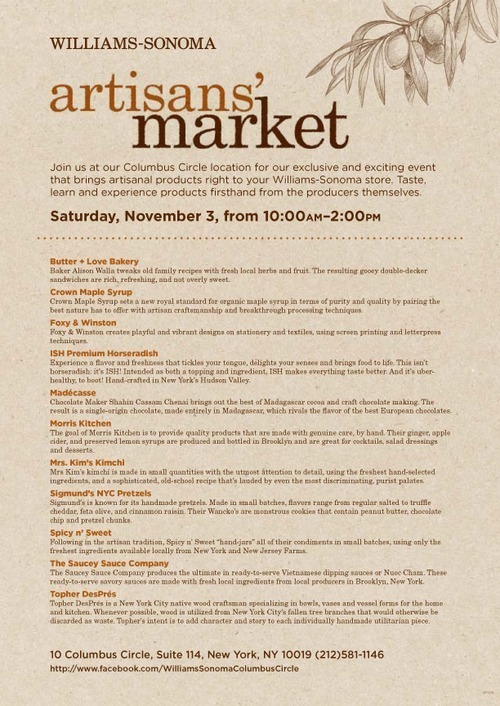 We are looking forward to this upcoming Saturday - we get to be a part of Williams-Sonoma Artisan Marketplace. Please come to Columbus Circle’s Williams-Sonoma and visit us this Saturday, November 3rd…we’ll be featured with our new aprons (for kids and adults! ), tea towels, napkins and boxed stationery!